When you have a showflat that is built on 4-storey high stilts at the side of a hill, you expect great things. And PARVIS certainly did not disappoint. PARVIS is a 248-units project at the former Holland Hill Mansion site. It consists of three 12-storey blocks on 246,000 sq ft of land perched on a hillside, and located almost at the top of Holland Hill. The expected TOP is in Q3 of 2012. The sales gallery/showflat has opened for almost a month and a total of 111 units are already sold as of yesterday. And unlike most Far East projects, all units at PARVIS are launched in one phase. PARVIS offers full facilities, with 4 different swimming/dip pools, Jacuzzi, spa pavilion, tennis court, BBQ area, children playground and Clubhouse with gym. It also comes with a 273-lots underground carpark. There is only one showflat unit on display - a 4-Bedroom 2,347 sq ft ground-floor unit with PES area of 495 sq ft. The unit comes with a private lift that opens into your foyer and a common lift accessible via the back door in the kitchen - this feature is common for all apartment types. Other features include a 3.3m high ceiling, marble flooring, a master bedroom plus a junior suite and a rectangular balcony that is highly functional. The living room space is generous even with the dry (they called it “Gourmet”) kitchen, so there is no need to move your 8-seater dining table to the balcony this time. A comprehensive list of De Dietrich kitchen appliances are provided, which include 2 fridges, dishwasher, storage system within the cabinet and even unique items like warmer drawers and steamer oven. However, washing machine and dryer are not provided – which is strange. All rooms have built-in wardrobes - even the cabinets under the bathroom sinks are built-in, and comes with Grohe bathroom fixtures. • The size of the units, and we are not just talking about the 2,000+ sq ft 4-bedders here. A 1,700 sq ft 3-Bedroom unit is so untypical of new projects these days, so the apartments at PARVIS do offer good living spaces. • The regular layout of all rooms within the unit, with no oddly shaped corners. We especially like the fact that the mater bedroom is tucked away from the junior suite and other bedrooms. This allows for more privacy from, e.g., nosey parents/in-laws staying over. • Sizeable “backyard” with back door access, which houses the laundry/drying area, bomb shelter/maid’s room and toilet. • Good quality furnishings and fixtures. 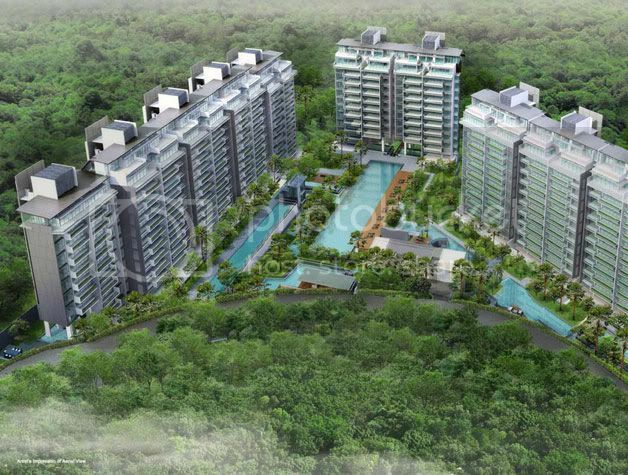 • PARVIS is located relatively near to the upcoming Holland MRT station (2011). There is a side-gate access that leads down to Chip Bee garden, and from there it is about a 10-minutes walk out to Holland Village. So accessibility to amenities is pretty convenient. • Holland Hill is the only access road up to PARVIS. This is a rather narrow road that opens out to Queensway, where you can only turn left towards Farrer Road. Given the number of existing and new developments on Holland Hill, we expect it can be quite a traffic nightmare during rush hours. • As far as we can identify, there are no primary school (especially the so called “prime” ones) within 1-km of PARVIS. So for those with primary school going kids in 2013/2014, plan to start volunteering if you have no affiliations. • As the development is built at the side of a hill and with underground parking, the word “flooding” does come to mind. Hopefully the developer has already made provisions to tackle this potential problem. For those considering a unit at PAVIS, we will recommend Block 12 (North-South facing). Block 18, despite the auspicious number, is least ideal as you get hit by the afternoon sun due to its East-West facing. So some of your bedrooms may actually feel like a sauna. Block 16 houses only 4-Bedroom units. No Comment to " PARVIS (Review) "